Nearly there! My due date is on Wednesday, and I'm hoping this one will stick to the schedule better than her brother. But, although my body has pretty much had enough now, this baby doesn't seem to be rushing! Walking can be a real struggle now, and I can't even begin to tell you how exhausting my last trip to the midwife appointment was... But when you get home and have a parcel waiting for you, that pretty much always makes things better - am I right? Here's what was waiting for me that day - this gorgeous bouquet. And would you believe it came from Home Bargains? I didn't even know they offered flower delivery until recently, when they kindly offered to send me some. 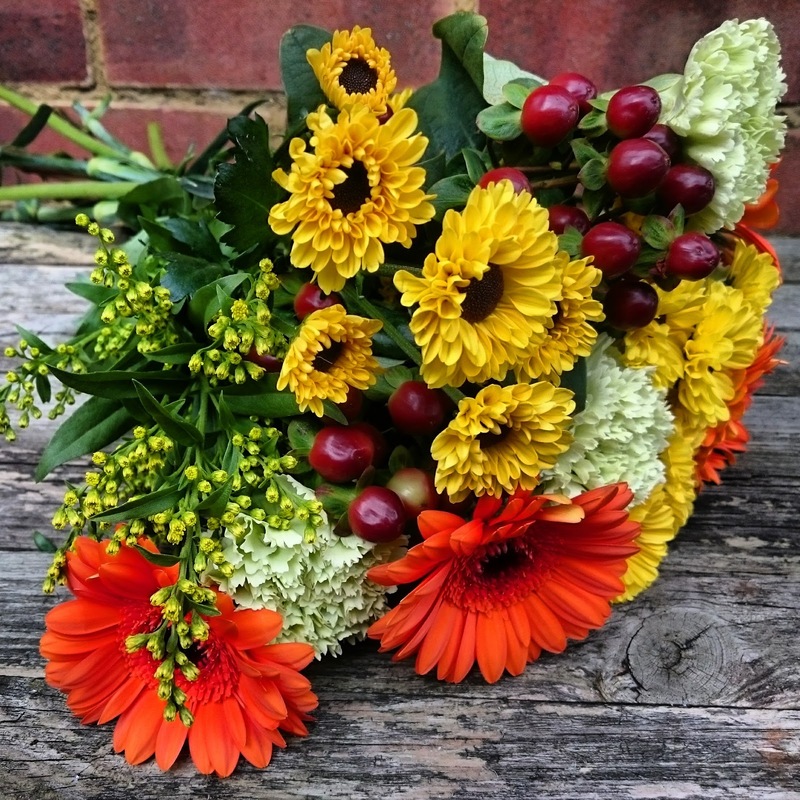 The bouquet I received is called Warm Wishes - it's a beautifully assembled bouquet of carnations, chrysanthemums, germini, hypericum and solidago. It's perfect for the current season, with the colours giving it this autumnal vibe. I was pleasantly surprised with this delivery - I was kind of expecting it to be one of these letterbox flowers services (ordered one of those once and it wasn't brilliant). Instead, Home Bargains flowers come as a fully assembled bouquet ready to be displayed in your favourite vase (and if you don't have one, you can add it to your order). They're perfect for all occasions - birthdays, anniversaries, congratulations (you might, for example, show a new mum you're thinking of her *coughs*). The flowers come beautifully wrapped, ready for gifting. The box doesn't say they're from the Home Bargains, so you can send them directly to the recipient. Alternatively, if you need the flowers for a specific event, you can order them few days in advance and not stress about finding a bouquet on the day. The stem wrap keeps them moist, making sure they arrive as fresh as when they were cut. If you want to treat someone (or yourself) to a bouquet like this, it's super easy. Just visit Home Bargains Flowers and choose your favourites. Select your preferred bouquet size, add a little extra like a vase, occasion balloon or a cute teddy bear. You can then add a short message to the recipient, and all that's left to do is choosing your delivery date - order by 4pm for free First Class delivery, or get it next day for just £2.95. And here are my Warm Wishes 10 days later, looking as fresh and fabulous as on the day they arrived! Need I say more? *The flowers were sent to me by Home Bargains for the purpose of the review. The above post is my personal and honest opinion on the product and service provided.